Best Dog Training in Monmouth & Ocean Counties! My wife and I have been married for over thirty years and have successfully raised two sons and a daughter. 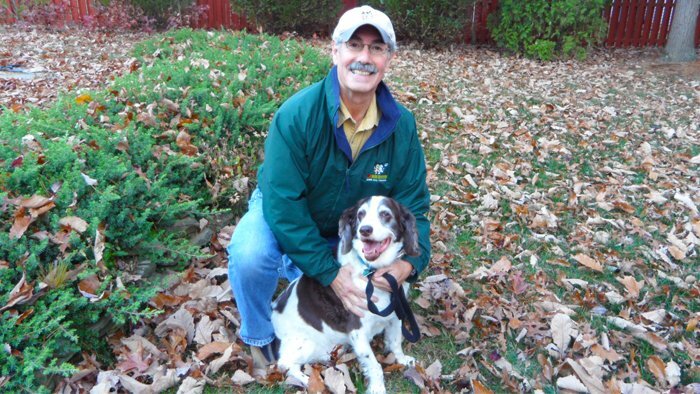 Our dogs have always been considered a loving members of our family, and our 13 year old English Springer Spaniel Nestle is no exception. After twenty five successful years in the agri-business corporate world, I was at a point in my life where I could bring my business/sales background and love of dogs together by joining forces with the great team at Bark Busters. Bark Busters has successfully trained over 1 million dogs worldwide. As an integral part of the organization, I am equipped to correct unwanted canine behavior using the most effective and natural methods. When the dog knows that it is safe and secure in its home the owners have successfully become its leader providing a happy home for both dog and family. I have successfully trained several thousand dogs consisting of various breeds, various temperaments and age groups. My training methods being nonphysical provides a tremendous difference in the quality of life for you and your dog. In short we bring our human owners into their dog's world. Having been a Bark Buster Owner for over last 11 years I have formed close working relationships with many vets in my territory. I have also trained many of their personal dogs and those of their staff members.I also do free seminars at their animal hospitals, public libraries, pet stores and other social venues. All this while also offering a reduced fee for the service I provide for those clients that have chosen to rescue or adopt a dog or puppy.My commitment to the dog world is to successfully keep every dog in its current home. As a certified dog Behavioral Therapist and Master Trainer, I work with my clients and their dogs until all problems are solved and behavioral compliance is achieved.By working to compliance the dogs respect for the owner will grow and the bond and trust between dog and owner will be greatly increased.Working in the home where the dog lives and training the owner in a canine way to gain the respect of their dog I am satisfying the social need and territorial nature of their dog. Incessant barking, destructive behaviors, house soiling, jumping up, leash pulling, separation anxiety and aggressive tendencies are just some of the unwanted behaviors I can help you change. Bark Busters in-home training allows me to evaluate and treat these behaviors in a non-stressful, holistic manner at a time that suites your busy schedule.